According to the National Fire Protection Association, the average home is likely to face 5 fires in a lifetime. Protect your home and your family by planning ahead. According to the United States CDC, over one-third of home fire deaths occur in homes without smoke alarms. A fire alarm system gives you time to get out of the home before you are overcome by smoke. It is best to have dual sensor smoke alarms, which contain both ionization and photoelectric smoke sensors. This means they detect both flaming and smoldering fires. While having a smoke alarm in the kitchen is important, smoke alarms should be placed on the ceiling of each level of your home. The National Fire Protection Association reports that over 30 percent of fire victims never wake up before being injured by smoke or a fire; it is important to install fire smoke alarms inside bedrooms and to have a smoke alarm in the hallway outside of sleeping areas. Test smoke alarms monthly, replace at least every ten years, and never take the batteries out of the smoke alarm. If the alarm goes off when you are cooking, press the “hush” buttons so that you can silence the alarm if smoke from cooking causes it to sound. Some people believe that fire sprinklers cause water damage, but that is simply not the case. 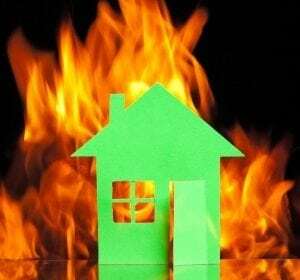 If you need the fire department to come put out a home fire, they will use significantly more water to put the fire out then a home fire suppression system. According to the National Fire Protection Association, fire sprinkler systems can save your life and lessen property damage by reducing the risk of dying by about 80 percent and reduce average property loss by about 70% per fire. There are many discrete, low profile home sprinkler systems that will not ruin the look of your home’s décor like industrial sprinklers. One of the best fire safety tips is to think ahead and have a plan. It is not easy to escape a fire, even from your own home. Fires are DARK! Try getting out of your house blindfolded to see what it will be like to escape a fire. Create a family escape plan with at least two different s escape routes for each room. If you have bedrooms upstairs, consider purchasing a UL certified fire ladder for each upstairs bedroom. Practice the escape plan twice a year. When you test the smoke alarm each month, teach children what the smoke alarm sounds like, and what to do when they hear the alarm sound. Make sure they know how and when to call 911. Have them practice reciting the home address. Don’t forget to designate a meeting place outside so that you can make sure everyone has escaped. Once everyone is out, do not go back into the home. Cooking is the leading cause of home fires. Most kitchen fires start because of unattended cooking; make it a rule to never leave something on the stove unattended, even for a minute. If you have to go to the bathroom, or speak to someone in another room, turn off the stove. While home fires are serious, they have been studied extensively. We know that if people follow the recommendations for safety and prevention, the chance for death, injury, and property damage decrease dramatically. All-Guard Alarm Systems is happy to help you come up with a fire protection plan to suit your home or business. Call us at (800) 255-4273 to discuss a free in-home estimate. We serve the San Francisco Bay Area and Santa Rosa Residents and Businesses.